SOUTHPORT, England — Cool your Delta jets, people. Young Jordan Spieth is not the next Tiger Woods. Spieth, 23, man-child of golf's promised land, showed that repeatedly in winning the game's oldest championship and the third leg of the career grand slam. He is Jordan Spieth, on Sunday a dune-running, putt-holing, thrill-a-minute sui generis golfing savant. And that is more than enough. He began Sunday with a three-shot lead over his playing partner, Matt Kuchar, with his perma-smile and loping gait and easy-going demeanor. Spieth said going in to the finale that Kuchar was an ideal playing partner, the kind of sentiment you never heard Tiger express in his life. More to the point, we all know what Woods would have done with a three-shot 54-hole lead: stolen all the available air from the event and ended the proceedings before making the turn on Sunday. Spieth is not built for that. He went out in 37, to Kuchar's even-par 34, and the game was on. If you did not see the Kuchar-Spieth back-nine unfold, you almost would not believe it. The roughly two hours it took, plus the aftermath, included not just everything you could want from your Sunday afternoon picture show. It was also a flat-out reminder of the greatness of the game, of sport, of the people who play it and run it and watch it. Spieth, after his drive on 13 went roughly 60 yards offline, dug in and found a way to right his capsizing ship. Anybody who has ever played this mind-numbing game, at any level, knows that once things start going south it is just about impossible to dig deep and find answers and make the swings you want and need to make. You no doubt recall his back-nine in the 2016 Masters, when he made the Sunday turn with a five-shot lead and finished three shots out of first. 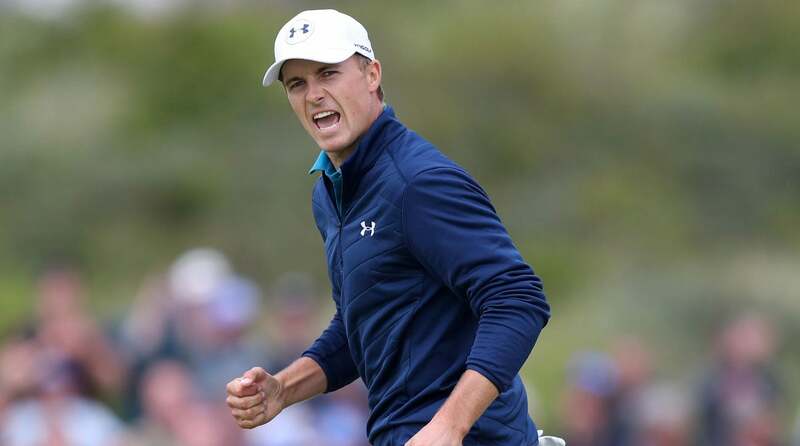 Sunday night, with the easy candor that makes him such a thorough pleasure to listen to in both victory and defeat, Spieth reviewed his final-round mindset at Royal Birkdale and said, "I was questioning why I couldn't just perform the shots that I was before. And sometimes you just can't really figure it out or put your finger on it. ‘Am I pulling it? Pushing it? Am I doing both? What's going on with the stroke?' It's just searching. And during the round today I definitely thought while any kind of fear or advantage that you can have in this moment over other individuals, not just Matt Kuchar today, but other people that are watching, that's being taken away by the way that I'm playing right now. And that was really tough to swallow. And that kind of stuff goes into your head. I mean, we walked for two minutes, three minutes in between shots. And you can't just go blank. You wish you could, but thoughts creep in." Thoughts creep in! It's not just us. Them too! Here's when Spieth said he became comfortable again: after the crazy, 29-minute bogey 5 he made on 13, even though it meant that, for the first time, he was no longer leading the tournament. Woods had a moment like that in his amateur career, in his 1996 U.S. Amateur final match against Steve Scott. But almost never as a professional. But Spieth is not the golfer or person Woods is. His grip and swing are a little funky. There is not a single aspect of his game where, even at his best, he is better than Woods was at his best. Yet he somehow has found a way to become the first golfer since Jack Nicklaus to win three major championships before turning 24. So how has he done it? That's what made this Sunday in particular and his career in general such an incredible joy to watch unfold. One of the joys, really. When it was over, he saw Kuchar's wife, Sybi, and their two sons, on hand on a surprise secret-mission from Colorado, tumble toward their father. "I saw his family hugging him, and I think it was Cameron, his oldest, who was in tears. And I'm so happy. And I thought to myself, ‘Man, put this in perspective. He's a dad.' And I was able to kind of get a little glimpse into what that's like.'" It is not every world-class athlete who has the ability to think that way. Yes, Spieth is aiming and trending for the stratosphere, for Trevino (six majors) and Hogan (nine) and beyond. Spieth now has the 2015 Masters and U.S. Open, plus the 2017 British Open at the regal links here, Royal Birkdale. If he wins the PGA Championship next month at Quail Hollow or at anytime in the next 30 or 40 years, he'll have the career grand slam, something achieved only by Gene Sarazen, Hogan, Gary Player, Nicklaus and Woods. He turns 24 on Thursday. You could make the case that the day should have been all Spieth, from start to finish, but that's because Woods changed our notion of what it means to close and what it means to be a dominating golfer. Kuchar's solid play—he closed with a 69—and Spieth's erratic play made the day what it was. Yes, Haotong Li, a sleek, 21-year-old Chinese golfer built like a racehorse, shot a Sunday 63 to post six under early. (Back in the day—Friday, July 21, 2017, to be exact—that would have been a historic round in major championship men's golf, but Branden Grace had already moved the goal line with a 62 on Saturday.) But even with Spieth's Sunday struggles, six under was never going to win this thing. Spieth's start was shaky. He made this-is-not-happening bogeys on the first and third holes and before the front nine was over he twice brought in his faithful caddie, the bearded former math teacher Michael Greller, to read three-footers on slow greens. In that Spieth is the greatest putter in the game today (although he's been less-than-great at times over the past year or so), those consultations left you nervous. If his pars on 10, 11 and 12 might have settled down the lifelong Dallas resident, you would not have known it, come 13. The day grew cool, Spieth pulled on a blue jumper, Kuchar hit a push into the right rough and then Spieth hit the tee shot that brought to mind the great and wild Seve Ballesteros at his absolute worst. This will go down in history as one of the worst tee shots ever hit in a major by an eventual winner. It took 20 minutes for Spieth, and several visits up and down the sandy hill, to figure out exactly how to take an unplayable lie there. He was walking past spectator cattle fences and by the massive, rectangular equipment trucks, amid scores of fans, golf officials and security officers. The bogey 5 he made there—playing his third shot, after taking a one-shot penalty for an unplayable lie—from the driving range was all-world. (Not Seve's car park, but wild nonetheless.) Kuchar's study-in-patience 4 was beyond all-world. We'll be watching that for years to come, but in truncated form. Watching it unfold in real time was painful and fascinating for fans. Imagine what it was like for Spieth? For the veteran rules official John Paramour? For Kuchar? "Matt had to sit there and say, ‘You've got to be kidding me,'" Spieth said. "I apologized profusely to Matt about the amount of time it took from when he hit his shot to when I played my second. Because that's tough. It's tough to play golf that way and step up and hit a six-iron when it's starting to rain and the wind is blowing and you haven't taken a full swing in probably 10 or 15 minutes." He was speaking of Kuchar's experience there. His empathy level is remarkable. Kuchar was the model of grace and understanding. "I knew that taking a drop far back on the range, trying to get the correct line that you take an unplayable drop, and then from there trying to figure out the distance, trying to figure out where to aim his shot. We knew we were going to be there for a while. We made ourselves comfy and told some stories. Certainly it was not anything I was ever going to be upset with. It's a very difficult situation." This is why we love the game! So now, on the tee at 14, it was Kuchar in the lead. For a nanosecond. Spieth made a birdie 2 on 14 after stiffing his approach shot, a cool-hand-Luke eagle on 15 with a putt of close to 50 feet, a birdie bomb on 16, a short-range bird on the par-5 17th and a don't-be-dumb 4 on 18. It all added up to 69, right alongside Kuchar's fine 69, and a three-shot lead and a three-shot win. Just as things stood before the day began. "I told Michael [Greller, his caddie] and Jay [Danzi, his mananger] after the round, 17 pars and a birdie would have been fine, too. But there's a lot of roads to get there." There are. There are a million roads to get there. There are a million ways to approach life. What works for one person might not for another. For much of his life, there seemed to be nothing more important to Tiger Woods than golf. It made him a golfer unlike any the game has ever seen before. Jordan Spieth is a different person and golfer, of course. He will almost surely never win a Masters by 12 or a U.S. Open by 15. He doesn't have that kind of firepower. But he has a balance in his life that shows up in his golf and in his press conferences and in his relationships with other players. At his Sunday night press conference, he ranked his life's priorities. "My faith and then my family," he said. "After that, you know, this is what I love to do."